Jacob Waites did the cover art for Molecular Cell magazine’s October edition. On the cover: CRISPRs (clustered regularly interspaced short palindromic repeats) and their associated proteins mediate defense against invading viruses in bacteria and archaea. In P. furiosus, multiple proteins assemble with a small RNA to form an effector complex that targets and cleaves viral RNAs, as discussed in Spilman et al. (146–152). 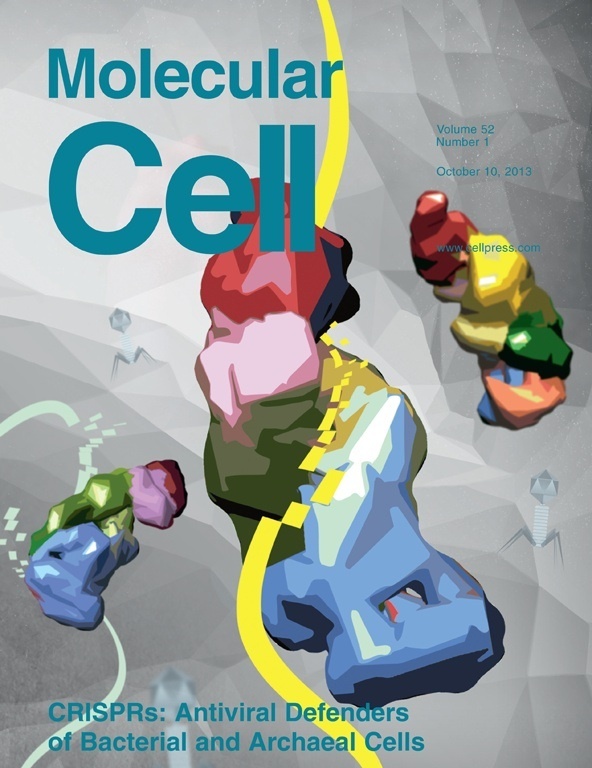 The cover image shows the structure of the P. furiosus effector complex. The different colors represent the six different proteins, and the complexes are shown attacking and cleaving RNAs depicted as a yellow and lime ribbons. The invading phage particles are shown lurking in the background.